The TouchDroid project has taken a big step forward as the CyanogenMod team has released the first alpha build of CyanogenMod 7.1 (based on Android 2.3.7 Gingerbread) for the HP TouchPad. Folks interested can even install it on their TouchPad right now by following our guide after the break! The news comes straight from RootzWiki – an Android development/hacking forum – in a post from the CyanogenMod Team where they announce Alpha 1 for TouchPad and answer frequently-asked-questions (FAQs). Before you get all super-excited, you must keep in mind that this is an alpha release. CyanogenMod 7.1 for TouchPad is still in the earlier stages of development and it will take some time before it is completely stable and ready for everyday use. Plenty of things work, but equally plenty of things do not e.g. there are still compatibility issues with many (popular) apps and power management isn’t very efficient so battery life will be short (this will, of course, not be an issue in the final build). 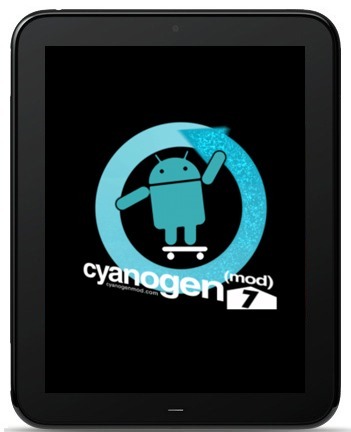 You waited more-or-less patiently for over a month, so at long last, here it is– an alpha version of CyanogenMod 7.1.0 (an enhanced version of Google’s Android 2.3) for the TouchPad. Understand, this version is definitely an alpha, with all that implies. Those expecting perfection will be sorely disappointed. Many things won’t work as well as they will eventually. But you wanted it ASAP, and hopefully, this version should be somewhat useable and gives a sense of progress. DISCLAIMER: Redmond Pie is not to be held responsible for any loss of data as a result of the malfunctioning of your HP TouchPad in the following of this guide. Step 1: Install Novacom for your operating system after downloading it from the above link. Extract the contents of ACMEInstaller.zip to the folder where you have installed Novacom. Step 2: Connect your HP TouchPad to your computer through the USB cable. You will see a USB Drive notification, tap it and mount your tablet as a USB storage device. Step 3: Create a folder named cminstall on your HP TouchPad from your computer and transfer the update-cm-7.1.0-tenderloin-a1-fullogbugs.zip, update-cwm_tenderloin-1012.zip, moboot_0.3.3.zip files to it. Step 4: Reset your HP TouchPad from Settings > Device Info > Reset. Your screen will now go dark. At this point, you must hold Volume Up until you see a USB symbol. Your computer should now be able to recognize your TouchPad (this may take some time, so be patient!). Step 5: Open up a terminal application. Use it to navigate to Novacom folder with the required commands (which will be different for Windows/Mac/Linux). Step 1: Download Google Apps [Download link] and transfer them to the parent directory of your HP TouchPad. Step 2: Boot into ClockworkMod Recovery mode. From there, choose install zip from sdcard > choose zip from sdcard > [Google Apps .zip file] and then reboot. If you face any problems or have queries, visit the official thread on Rootzwiki.